Tool steel is provided by the mill to the service center in bar or plate form. 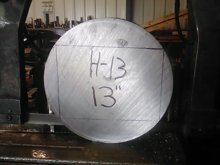 These bars and plates must be cut into the desired shape and size before they can be used. The service centers use bandsaws and plate saws to cut the bars and plates into pieces. These bandsaws and plate saws use continuous thin blades. The backing of the blades are made from a soft flexible metal band. The cutting edge of the blade contains the teeth made from high-speed steel which is welded and ground to the thickness of the backing. The blades are available with many different tooth spacing and pitch configurations for different materials and sizes. Because of the high alloy content in tool steels, cutting can them can be challenging. 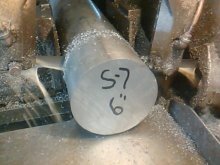 Tool steels are more difficult to cut than low carbon alloy steels. Aggressive high-speed steel blades and slower speeds are used throughout the tool steel service centers. Below is a table depicting the proper blade speed for various tool steel grades. The speeds are expressed in feet per minute.